G20XW ... sound attenuated version. Doosan Portable Power has launched a new range of four generators from 20-60 kVA for the Middle East and Africa, available in both 50 Hz and 60 Hz versions. The new generators are suitable for the construction, rental and agriculture sectors, and have now been extended to a wider audience to cover applications such as home standby, telecommunications and back-up power for small businesses. The four models in the range – the G20, G30, G45 and G60 – provide prime power outputs of 20, 30, 45 and 63 kVA, respectively, and are available as open units (XF) or sound attenuated versions (XW). The equivalent 60 Hz versions are also available in a range of voltages between 220V and 480V (Phase to Phase). Sharing the same design and characteristics, the new generators offer robustness and reliability, high performance and a wide choice of features to meet the needs of a range of power applications from prime power in remote areas to stationary units in grid back-up, says a company spokesman. The standard-frame fuel tank configuration of the generators ensures autonomy of at least 15 hours at 75 per cent of the load, allowing users to work regular shifts without refuelling concerns. “Safe and easy access to operation and maintenance areas has been a priority throughout the design of the new generators,” says the spokesman. A user-friendly feature is the electrical control and power compartment which has been designed to meet the highest safety, reliability and flexibility requirements. The units are powered by well-proven Cummins diesel engines and are covered by the best standard warranty on the market – two years and/or 4,000 hours on the complete powertrain. 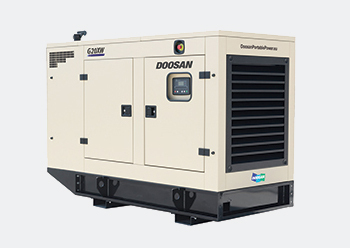 The new generators are fully supported by the Doosan Portable Power dealer network for the Middle East and Africa. In addition to dealer parts stock for planned servicing or emergency needs, parts are also available through the firm’s network and from Doosan Parts warehouse in Dubai, UAE.